There are 6,000 species of dung beetles. The best known is probably the Scarabaeus sacer (scarab beetle) from North Africa who was worshiped in ancient Egypt and was depicted as a scarab. They live on predigested plant residues, manure, particularly of larger mammals such as cows and horses. 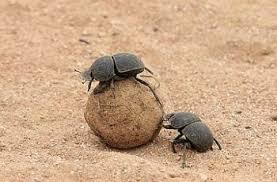 About 10% of the dung beetles roll the found loot into a ball. Which is then, backward walking, diametrically and as quickly as possible rolled in safety to their underground nest. Where the larvae, which need several years for their, are coming feast. Regularly the beetle climbs during transport on the ball, makes a small round dance, and continues his path. This dance he does to orient himself to the sun, or if she is not visible during the day, the polarized light from the sun that they can distinguish. Scientists have shown that they at night are orienting according to the Milky Way. If their direction is disturbed by an obstacle, they determine wuth the dance again the right direction. Another reason to climb on the dung ball is the hot African sand. With 55 to 60⁰ C are the legs of the beetle (30 to 35⁰ itself) hot. Just as we on a hot beach go quickly stand at our towel, the beetle climbs than his cooler dung ball. Dung beetles are important injectors in nutrient-poor soils, and are spreading seeds.